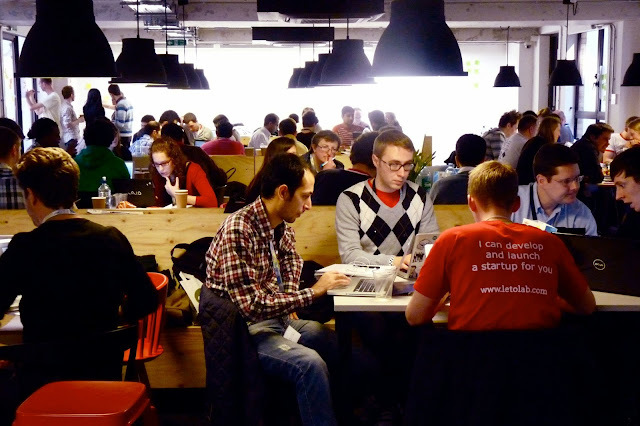 Google Europe Blog: Google Campus is coming to Spain! and Campus Tel Aviv. We've seen incredible momentum in these two spaces. In 2013, startups at Campus London raised more 34M GBP, and created more than 570 jobs. We recently announced new Campus locations coming to Warsaw, Poland, Sao Paulo, Brazil, and Seoul, South Korea. Entrepreneurs at Campus Madrid will benefit from this global network of Campuses, including our Campus Exchange program, giving entrepreneurs access to other workspaces around the world. In addition to global opportunities, we will run many new programs in our Madrid location, including Campus for Moms, CampusEDU and Office Hours with Googler mentors. We decided to open a Campus in Madrid because of the thriving entrepreneurial spirit in Spain. We have seen the booming entrepreneurial community in Spain and are excited to join the local community in making it even stronger. Our hope is that Campus Madrid will supercharge tech entrepreneurs, strengthen the startup ecosystem and encourage even more innovation in Spain, Europe, and beyond. We look forward to opening our doors next year and filling Campus Madrid with startups! Google began as a startup in garage, and supporting startups remains a very important part of our DNA. We continually see that when people are empowered to dream big and are empowered to take action, that entrepreneurs turn those ideas into growing companies, creating a powerful startup community, solving big problems, and supporting a thriving economy. So today we're thrilled to announce Campus Madrid, a new home for innovation in Spain. Campuses are Google's spaces for entrepreneurs to learn, connect, and build companies that will change the world. At Campus, entrepreneurs get unparalleled access to mentorship and trainings led by their local startup community, experienced entrepreneurs, and teams from Google. Two years ago we opened our first Campuses, Campus London and Campus Tel Aviv. We've seen incredible momentum in these two spaces. In 2013, startups at Campus London raised more 34M GBP, and created more than 570 jobs. We recently announced new Campus locations coming to Warsaw, Poland, Sao Paulo, Brazil, and Seoul, South Korea. Entrepreneurs at Campus Madrid will benefit from this global network of Campuses, including our Campus Exchange program, giving entrepreneurs access to other workspaces around the world. Hi when is it gonna be open? Will portuguese startups be able to join the Google Campus Madrid? So.. how can Spanish start-ups apply? I would like to attend this event, how can I subscribe to the updates about it??! It´s great to see Google coming to Madrid. Please inform us how and when we could apply for being in the campus!. hi!! I tried to talk to Mary in the last Startup Summit in Las ventas, please check out our web site www.santodomingocn.com We have the place you need!! And of course it is open tu every startup who want to be in Madrid! Hi, any news about when the campus will be open? Campus Madrid opens today: https://www.campus.co/madrid/en/events !! Hi! I am reading this great creation of google, I would like to know if Mexico has a campus like this to startups and enterpreneurs like me, we are a lot.